Like two lovers who had been uncomfortably matched, endlessly engaging in argument and power plays, Science and Spirit finally became separated. The Industrial Revolution sealed the deal, and for a time it looked like this divorce was final. But their tryst has begun anew, for they are, in essence, inseparable partners. Science explains in facts and findings, in reason and objective thought what Spirit stirs through faith and intuition, through inner gnosis and through divine revelation. Spirit gives esoteric meaning to the discoveries of Science. Together they describe our relationsip to the Deity and to Cosmos and to one another, and give our existence meaning. Science, however, is still quick to mock as fanciful the musings of Spirit, while Spirit is reluctant to reunite with a lover who seems cold, self-absorbed, and decidedly unromantic! Nevertheless, the time has come for Science and Spirit to be reconciled. The wedding takes place when Neptune and Uranus join forces in Aquarius, on January 30. Their union will cause a social revolution in what is prophesied to be an age of enlightenment and unprecedented scientific discovery. Physics and Metaphysics are so akin that they inevitably meet at the point of Why? Physics is intrinsic to Metaphysics which actually means that which lies above or beyond the physical world as the spiritual Cause preceding the material effect. Two men, Dr. Paul LaViolette, a physicist and systems scientist, and the late Dane Rudhyar, a metaphysical astrologer, from their respective camps, have forged groundbreaking work and have come to an exciting similar conclusion: to meet the urgent demands of cycles turning and soon upon us, our heliocosmic solar-based mentality will no longer suffice! The time has come to understand our place not just within the solar system but as members of the galaxy! 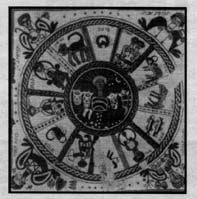 Rudhyar was one of a still rare but growing breed of astrologers who perceive astrology as an ancient and sacred science, a key in the process of unlocking an inner divine and normally largely untapped potential. Rudhyar separates himself from fortune-tellers and even well-meaning modern western astrologers who for the most part are concerned with prediction and base their art on Ptolemaic concepts from ancient Greece and later from Rome. For Rudhyar the value of astrology lies in helping people understand events and experiences in their life as part of a lifelong process of self-transformation and self-transcendence. In mysticism, such experiences are called initiations, spiritual tests which step-by-step, test the mettle of those aspiring to oneness with God. Most people, says Rudhyar, are walking their way on the highway of evolution. On the highway of evolution, change and growth are slow and hesitant. One’s life is caught up in the common trends of the time. This would be your average person, whose life and astrology is in fact highly predictable from the natal chart. We can choose to leave this common highway, however, and enter the Path. The Path is in essence the Path of Discipleship. The Path implies a relationship to a master teacher or guru, whether in embodiment or whether instructing from higher spheres, as Jesus was instructed by the Father. But above all, the Path implies a readiness and a will to ascend toward a higher spiritual level of consciousness and existence. At the same time, the Path implies that a being of superior attainment, operating from a transcendental state, descends out of compassion to assist in this spiritual unfoldment those who make sincere and consistent effort. In Rudhyar’s astrology, this Path leads from a heliocosmic to a galactic type of consciousness and activity. For the galactic and esoteric astrologer, then, while the planetary bodies remain in their place, their interpretation is greatly altered. The signs become great hierarchies of light, the planets become agents of the galaxy. Dr. LaViolette is president of Starburst Foundation, an institute that conducts interdisciplinary research in physics, astronomy, geology, climatology, and systems theory. LaViolette was courageous in that he looked to astrology and mythology, considered bogus fields to the rational scientific mind, to discover scientific answers that had eluded his contemporaries. He focused on cosmology, the science of creation. LaViolette also sought to give scientific explanation to the many reports of world cataclysm, related in oral traditions from every corner of the earth and from diverse peoples and times. In understanding man’s history of global cataclysm, LaViolette was especially interested in determining the possibility and timing of such a recurrence in this or future generations. LaViolette noted that only in this century have modern science and astronomy advanced to the point that we can now recognize in myth not a fanciful cultural tale, but rather the outlines of a physical science originating in prehistoric time which far exceeds our current knowledge and understanding. We’ve canned such stories to the level of myths and legends because we didn’t have the means to decode and understand what they are really trying to tell us. LaViolette, like Rudhyar, believes that astrologers practice an outer form of an inner art whose original meaning and purpose has become obscured or lost. Astrology played a central role in the ancient Hermetic science, when disciples were initiated into the Egyptian Osirian mysteries. Many esoteric teachings and Plato suggest that astrology was handed down to Egypt, China, and India and to former South American and Central American civilizations that flourished before the sinking of Atlantis, around 12,000 years ago. LaViolette believes that ancient sages encoded into the universally understood star map that the symbology of astrology affords a testimony of an incredible history they survived. They used astrology to ensure that their story not be lost through the shifting sands of time but that people of all times might have a record of their experience and receive an urgent warning. Now, here’s the catch: to decipher the hidden message, one needs knowledge not only of astrology and mythology but also of physics, astronomy, and nonlineal chemical kinetics. When the riddle is resolved, one is left with a coherent theory of how matter and energy first came into being eons ago and of the continual evolution of physical creation. Moreover, a complex and sophisticated astronomical and geological message emerges, informing us and future generations of one of most horrific catastrophes to afflict the human race: the occurrence of an explosion of our galaxy’s core. Moreover, the warning clearly states that this disaster could repeat. — 1979: Galactic Explosion Hypothesis: At the time that LaViolette begins his research, most astronomers agree that the core of our galaxy is relatively quiescent and should remain so for tens of millions of years. LaViolette, having cracked the zodiacal cosmocreation cryptogram, does not agree. According to the starscript, he interprets that an immense explosion occurred at the center of our galaxy thousands of years ago. Moreover, the story that unfolded suggests that the core of our galaxy enters a cyclical explosive phase during which intense winds of cosmic ray particles are released equivalent to the energy released from five to ten million highly energetic supernova explosions. — LaViolette concluded that these outbursts recur every ten thousand years or more and last anywhere from several hundred to several thousand years. Cosmic rays of this sort travel outward from the Galactic Center at very close to the speed of light. One such cosmic ray volley passed through the solar system toward the end of the last Ice Age, injecting large amounts of cosmic dust over a period of thousands of years. This dust dramatically changed the earth’s climate in a period of less than one hundred years through its effect on the sun and sunlight transmissions through space. — LaViolette formulates his hypothesis that a volley of cosmic rays had bombarded the earth and solar system toward the end of the last Ice Age causing worldwide destruction. He theorizes that other such superwaves had passed the earth at earlier times, triggering the onset and endings of the Ice Ages. He then sets out to test his hypothesis by initially analyzing Ice Age polar ice for traces of cosmic dust. — 1980: LaViolette is the first known scientist to evaluate the extraterrestrial material content of prehistoric polar ice. He finds they contain high levels of cosmic dust, indicating that galactic phenomena may have affected our solar system in the recent past. — 1983: LaViolette completes his Ph.D. dissertation and presents his cosmic dust findings at the American Geophysical Union meeting in Baltimore and at the Meteorological Society meeting in Mainz, Germany. He presents data indicating that debris from the nearby North Polar Spur supernova remnant is presently engulfing the solar system. He finds he is a lone voice in the wilderness. Despite LaViolette’s evidence to the contrary, his contemporaries are not concerned with the threat of cosmic dust, since the prevailing view is that the solar system resides in a predominantly clear interstellar environment. — Geological records support ancient myths and legends telling of an Ice Age that abruptly ended in a period of excessive warmth. This occurred about 14,650 ago. Climatologists were stymied in that they could not explain what caused the earth to warm up to present intergalactic temperatures at a time when ice sheets still covered the surface of the planet. LaViolette presents evidence that severe weather changes during this period were global in nature and that global warming was due to a galactic superwave-induced cosmic dust invasion that created an interplanetary hothouse effect. (See Earth Under Fire, pp. 177 -178). — 1984: LaViolette backs his thesis by working in conjunction with geochemists at Curtin University of West Australia, who have access to the rare and expensive spectrometric device, confirming that tin dust sample is indeed of extraterrestrial origin. — 1984: LaViolette analyzes zodiacal dust and finds that interstellar dust has recently entered the solar system from the Galactic Center direction. — 1985: Discoveries are made by high-level physicists that the earth is being showered by cosmic ray particles capable of traveling thousands of light-years through interstellar space without being scattered by interstellar magnetic fields. This confirms LaViolette’s 1983 findings that cosmic rays are able to travel all the way from the Galactic Center and impact our solar system as coherent volleys. He is the first astronomer to suggest this idea. — 1988: Astronomer H. Aumann publishes his observations that the solar system is surrounded by an envelope of dust 500 times denser than previously thought. — 1993: Ulysses spacecraft team publishes findings that interstellar dust is currently entering the solar system from the Galactic Center direction and that most of the dust is of interstellar origin. These findings confirm LaViolette’s statement of the interstellar origin of the zodiacal dust cloud. — 1987-1996: Climatologists publish temperature profiles from around the world showing the presence of climatic oscillation. Earth Under Fire by Paul LaViolette.” src=”http://etheric.com/wp-content/uploads/2013/04/bethalpha.jpg” width=”197″ height=”199″ /> The zodiac panel appearing in the floor mosaic of the Beth A/pha Synagogue from the book Earth Under Fire by Paul LaViolette. According to LaViolette, as many as two superwaves may have already left the Galactic Center and be speeding toward our solar system, but there is no way that we can see them coming. A superwave shock would announce itself only minutes before its arrival. LaViolette concludes the beginning phases of his monumental and lifetime work by warning that we should take steps to investigate how modern technology might be used to lessen the effects of an impacting superwave should one arrive in the near future. How could this be done? Perhaps by finding a way to create some sort of force field just outside the solar system on the side toward the Galactic Center that would act as a shield to deflect approaching galactic cosmic rays so that they would pass around the solar system. It seems as if LaViolette has left no stone unturned. But for me, one of the most exciting parts of his book Earth Under Fire was in a footnote. He explains that we can easily understand that prehistoric people, frightened by the traumatic effects of a galactic superwave, might deify the galactic core and pray to it in hope of salvation from the destruction it would otherwise inevitably bring. He points out that Jose Arguelles, for his work on the Mayan Prophecies, “suggests that a supreme Galactic mind actually resides at the core of the Galaxy and that this intelligent consciousness has been emitting a pulsating beam of radio signals which, for the past 5000 years, has been sweeping past our Solar System programming human consciousness by direct resonance with our DNA molecules.” While LaViolette’s mind seems always open to new possibilities, this leap in consciousness is too great or at least not as yet sufficiently scientifcally proven for him to make. This precise point, however, is where Rudhyar’s work comes in. Could not this force field of protection come not from technology but rather from a humanity vibrating at a higher and more powerful frequency than at the present time? 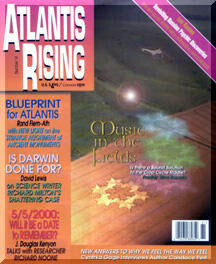 In our next article in Atlantis Rising we will explore what it means for us individually and as a planet to move into a galactic frame of reference and how astrological cycles predict the timing that this change in consciousness must occur, lest we be found unprepared to meet the challenges LaViolette describes. It is astounding to contemplate that only a hundred years ago, the very notion of meteorites falling from outer space was unknown. A little over two hundred years ago, Copernicus’ book proving the earth revolved around the sun was still on the forbidden Catholic reading list. It is as if we are awakening from a long and drugged sleep. As cosmic dust is thrown on our newly weds, here’s to the marriage of Spirit and Science. May they live happily ever after!